The Pebble Mill canteen was on the seventh floor of the office block, and had a great view over leafy Edgbaston and the Birmingham skyline. 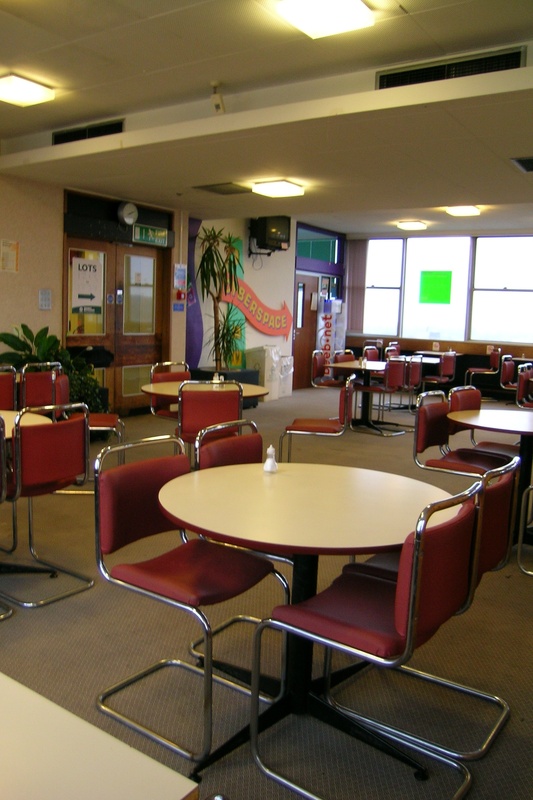 Most staff would have their lunch in the canteen, and enjoy a reasonably priced hot meal. Their hot puddings, served with custard, were particularly prized. The canteen were also renowned for their tasty cheese scones, ready mid morning, and their afternoon cakes, which came out at around 3.30pm. Breakfast and a hot evening meal were also available, so that staff working early or late were catered for. The door you can see at the back of the second photo is the entrance to the smoking area of the canteen – a small separate area usually veiled in a smoky fog. 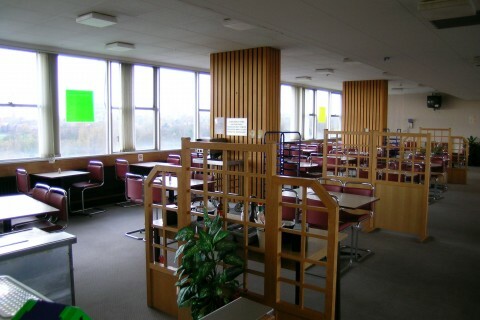 For the BBC staff who moved to the Mailbox, the loss of the facilities of the Pebble Mill canteen were keenly felt. I used to present for WM and remember the excellent food from the canteen. Sorry folks, I refuse to call it a restaurant. Having a sweet tooth, my favourite pudding was chocolate crunch with chocolate sauce. If you’re a real chocoholic like me this was a must whether you were having a good day or not. I remember sitting next to Ross King one lunchtime and flicking the peas off my plate into his custard. (un-intentionally you understand) I hope he’s forgiven me by now. BBC catering in Birmingham was a hard act to follow and was as good as any professional restaurant. I can’t imagine how the scones passed me by. If Tracy would care to share the recipe with us all……? Hello to Pete Simpkin by the way. A good old mate and a great teacher in broadcasting skills.